This morning spotted a Crossfit Endurance (CFE) tweet, which suited my plan for today in the most excellent way. Over the past 13 days I’ve trained 12 days and start to feel real fitness returning. Time to work a bit on speed without going too fast – without injury. CFE linked to their own blog post that suggests a few options for W.O.D. – Workout Of the Day. For me Thursday is currently a running day and the runs are right now somewhere around 6-8km and 35-45 minutes. CFE’s suggestion was a training with long intervals, going all out for 5, 6, and 7 minutes with 2m30s and 3minutes breaks between intervals. 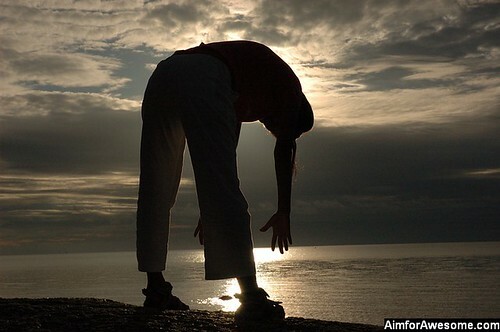 With 10 minutes warm-up and 10 minutes cool-down that pretty much would add up to 43m30s – just what I need. Did the training and enjoyed the long, hard intervals very much. Had trouble keeping a high pace, especially in the 7-minute leg of the interval. Normally I find it a pain to keep track of where I am in an interval like this one, but with the Garmin 910XT (as well as with many other modern heart rate monitors) you can create workouts targeted to what you’re going out to do. This is a quick write-up and by no means a product review. In this post I’ll briefly try to cover my experience from a run done with both devices. 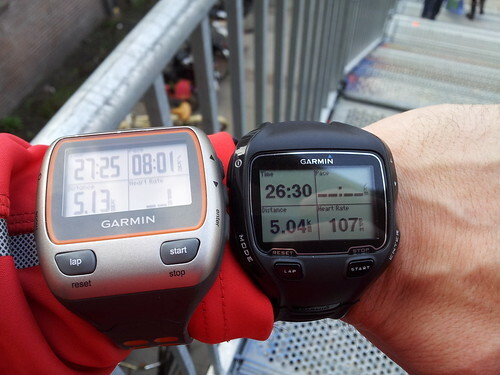 As you can see on the image to the right this covers an approximately 5K run with both watches on the same arm. You’ll notice that the 310XT has been active for longer. It takes the 310XT longer to register non-movement, so it doesn’t pause as quickly. In fact “elapsed time” on Garmin Connect tells me that I was out there for a total of 27:31. More on pace: the 910XT seems to be more spot on in general. The 310XT would have moments of 3minutes and change per kilometer, which is way faster than I can run right now – especially with a backpack. I guess that’s pretty much it. The run isn’t really the reason to change from 310XT to 910XT anyway – the 310XT is still an excellent piece of hardware. No… the main differences come in swimming and cycling. Of course later this year Garmin will come out with the Vector pedals that measure power and integrate with the 910XT – not with the 310XT. In addition – and I’ve been enjoying this so far – the 910XT can measure your swim like I did this morning. I still need to perfect that. Generally I get distance which is about 100 meters too long on 1250 meters. That sounds like about 8% error to me. That’s a bit high and I’ve heard about worse for the 910XT. Potentially this can be fixed in firmware later on…? In case you’re in doubt, the 910XT is the clear winner so far. For the multi athlete it’s simply version 2.0 of what was already a very good experience. On the 3rd of July it was finally time to toe the line at the inaugural Challenge Aarhus of 2011 – a half distance triathlon with 1km swim, 90km bike, 21,1km run. Months of training with hours of training per week was about to climax in what I hoped would be less than six hours of triathlon activity. Swim had been shortened for safety reasons due to low temperature (13,7C) so less than six hours looked very likely. Slept OK the night before the race and woke up well in time for my race morning plan and could take the car to the start area with no stress. Good start of the day. With three transition bags and a start bag packed and ready to go there was plenty of time to get all bags properly placed and change to my wetsuit for the start. So wetsuit was on at about 7.15 and from then on it was more than an hour wait to get into the water. Finally it was time for my wave to make our way into the 13 degree celcius cold water. Even with a wetsuit that water felt very cold. One of the other guys in my wave had done all his open wate training in Indonesia. HE was feeling cold. Just a few minutes to the start now – everyone were eager to get going. Tooooooot! And of we went. Man, that water was cold!! For the first 25 meters or so I just couldn’t seem to breathe right. It was as if the low temperature along with the sudden increased physical activity prevented proper breathing. That was a surprise. Anyway, the swim went fine. I’m not a very good swimmer, so because I don’t race up in front with the tough guys, I also tend not to get hit or kicked a whole lot. The water was pretty calm too, so 1000 not so eventful meters later I got out of the water, ready to transition to the bike. Earlier this year I did a self supported half ironman as previously described here. Having done that and with two more months of training, I figured I’d have no problems getting through Challenge Aarhus. There’s half distance and there’s half distance, though. Challenge Aarhus proved to be a LOT hillier than the route I did in training. I guess I also did it a bit faster – maybe not so smart. The bike section of Challenge Aarhus takes you through some of the most stunning scenery of East Jutland in Denmark – just truly spectacular. Add to it that participants get to ride the route completely without having to worry about other traffic than fellow participants. At the 2011 version of Challenge Aarhus the organization and volunteers took excellent care of participants on all legs of the race. On the bike that meant two major aid stations with all you can eat and drink energy. The days leading up to the race had been fairly wet, but when we started on the bike it hadn’t been raining for a while and the roads were getting increasingly dry. Conditions proved excellent for cycling. I just took it easy going South through the forest and slowly build some speed. Just enjoyed the non-drafting cruise. Maybe I did increase the speed a bit too much, going too fast and spending too much energy on the hills South of Aarhus. I came back to the transition zone feeling a little tired, but ready for the run. After a quick change to running gear I exited the transition tent for the last leg of the half distance – the half marathon. I’ve been living in Aarhus for several years, but I never thought of it as a hilly place – not the center of the city, anyway. This particular Sunday Aarhus had suddenly grown some hills. The Challenge Aarhus run had 3 laps, taking triathletes through the center of Aarhus – plenty of spectators watching for the fast guys – not so many when I passed by. Still the experience was great. With three aid stations along the route, the major challenge being the stairs of ARoS Museum of Art and plenty of participants struggling through the last bit of the race – everyone with the last little bit of energy just disappearing from the legs as they carried on putting one foot in front of the other. Just spectacular! My run didn’t go so well. Well… I guess it went alright. Given the amount of training that I’d done, the hills on the bike and run course and my relative lack of experience with the distance, I guess it went pretty OK. Still, this marathon was quite a bit slower than my only experience with this triathlon distance so far. My guess is that I just wasn’t as good at taking in nutrition at the right times and that I maybe raced a bit too much on the bike leg. Or maybe it just was the hills on the run – and those stairs. Either way I managed to finish my half marathon strong – ran much faster the last few kilometers with each taking less than 5 minutes. Even outsprinted a few of my fellow participants going down to the finish and shot over the finish line to finish my first ever official half distance triathlon. What had started in December of 2010 as one of these half crazy ideas and a bit of a dream of doing a long triathlon had finally become reality thanks to the crew and volunteers around Challenge Aarhus. My entire race was a magnificent experience from I signed up to the race until this moment where I sit and think back at the race. I hope the other triathletes at Challenge Aarhus 2011 will do that as well and think: I too was fantastic! After signing up back in December of 2010 triathletes have spent most of the spring of 2011 training for the half iron distance Challenge Aarhus – many of them for the first time. The race was to take place in the city of Aarhus with a swim in the bay, a bike ride to the scenic South of Aarhus, and finally a half marathon through the city of Aarhus, which also happens to be my Danish home city – hence why I had to be part of the inaugural event! Training has had its ups and down, all of them quite well documented on this blog already. This post is about the pre-race prep where all training is done and all that lies between the triathlete and the finish line is preparing everything that is brought through hours of suffering on race day. Going to a race is always special to me. I don’t go to many races, so packing for a race doesn’t happen too frequently. The past few days before my leaving for Denmark I got increasingly more excited and nervous about the project. I would wake up at 4-5 in the morning, thinking about Challenge Aarhus and how the race would go. I would lie there thinking race strategy, nutrition plan, etc. Eventually on the day of departure everything was packed with the great help of the triathlon race checklist service and off I went. As soon as I arrived in Denmark I laid out my stuff on the floor of my Mother’s home North of Aarhus – just to make sure it was all there. Everything was there and checked out perfectly! Now it was all just a matter of waiting and working a couple of days in Denmark before the pre-race prep would take over. Friday I went to the expo to to buy a pair of compression socks. The real fun was about to start on Saturday at race check-in. On Saturday first order of the day was to attend the race briefing. There had been doubts about the swim due to the bay having been polluted by sewage trouble (something the city of Aarhus apparently allows to happen every few years), and that continued at the race briefing with the sewage trouble being the main source of concern. It was considered an option to skip the swim altogether and do a duathlon instead. However, the swim eventually happened on a shorter course than planned. The reason for shortening the course was cold water. At temperatures below 14 degrees C race management deemed it unsafe to swim further than 1km – a wise decision. My speed bump came at the bike check-in. Coming into the bike zone I thought the officials were joking when they didn’t approve my helmet for the race. It appeared that it had a crack right at the front. Thanks to the triathlon expo just 100 meters away I managed to get a new helmet and check in 10 mins before the bike zone closed. Finally spent some time at the pasta party eating a bit with an old colleague from Amsterdam, Henrik Tholstrup, and meeting up with Facebook race buddy Søren Jakobsen – both would eventually finish the next day in very respectable times! When you set your goals, set them conservatively – not boldly! It’s a fine balance: push yourself, but not too far! Recently participated in the half marathon across Storebælt in Denmark. It’s interesting – when you sign up for these kinds of races they always ask you what kind of time you have in mind that you’ll do. That’s done in order to let the fastest runners start first, then the 2nd fastest, then the slower and so on… and that’s all good and great. The fun part is that it makes you think about your goal time amd then gets you thinking about how to get there. Trouble is that the sign up is so long before the actual event that – unless you know your own build-up very well – predicting how you’ll do becomes a somewhat difficult matter. I signed up for Broløbet 2011 almost 6 months in advance. 6 months out there was no telling what might happen in-between the date I signed up and raceday. All sorts of stuff could have happened that should have led me to change my goal time up or down. In addition, if you’re on a new course, that might make the task even more complicated. How steep are the hills and how long? Will you have long stretches where wind might play a part – oh – and how will the wind be on raceday?? What if it rains, snows, is just really cold or just really warm??? Now, I set my goal time in December and as with the ironman I’ve been testing myself to see if I could at all do that kind of time in a half marathon. I was pretty set to go and do my goal time and had actually officially taken on a challenge with my brother in law that if he’d go for a personal record, then I’d do then I’d do the same. But even if I was all set external factors could still screw it up. Take a good friend of mine, Lasse. He had been training for this race in his first full running season after putting the running shoes back on. He’d set a goal and training went well – but then he got injured; running in the wrong type of running shoes did that to his training. Some time went by for recovery, he got himself some good advice on running shoes and got back into training – which went really well. After a training session he and I had in February he started adding kilometers to get to half marathon distance. It went well, but fairly soon he had another injury, prompting him to consider whether he might even have to abandon the race. Eventually he did the race and performed better than he had thought in the beginning of the year, but maybe not as he could have been had he avoided injury. My point is this: When you are an endurance athlete with jobs and parenting to be done, both of which will take priority over your sport, you can benefit from setting conservative goals and be happy when you reach them. Conservative goals will largely ensure you don’t over-train, over-reach or get injured. They will make sure that you will be able to get better, reach your goals, stay healthy and fit to set new goals for the next season, where you can set new goals – conservatively improving on the year before. Posted byJakob June 24, 2011 Posted inCycling, Duathlon, Half Ironman, Half Marathon, Ironman, Marathon, Running, Sports, Swimming, TriathlonTags: Cycling, endurance, goals, running, swimming, TriathlonLeave a comment on Set Conservative Goals ! Towards the end of April we spent some time in Luxembourg. The country has some of the most beautiful nature I have ever experienced, and I took the opportunity to get in some training. At this stage Challenge Aarhus is just two months away, so I should really start to have the fitness for the distance. Only thing left is to build a bit on that and make sure that tempo and speed get trained as well. In this post I’ll share my learning from Camp Luxembourg. 2x bike trainings @ 5h15m. Total training time in the neighborhood of 11 hours 20 minutes. That felt like a pretty solid week’s work – more than I can normally fit into a single week. Actually it was more than I can usually fit in two weeks. The week was different in other ways too. The Amsterdam area where I usually do my training is flat as a pancake, but Luxembourg in contrast doesn’t have a flat kilometer in it, if you know where to go – literally. To make my point, I recently did a 90km ride in the Netherlands with a 59 meters elevation gain. In Luxembourg I did a 95km with a 1569 meters elevation gain. Sure is a special training location!! It’s the same regarding running sessions. Normally in the Netherlands I would need to run into Amsterdam Centre and run the canal bridges to get a bit of elevation. In Luxembourg I run out of the door and have a relatively high total elevation before I’ve run a single kilometer. For both running and cycling I found that I’ve probably spent too little time training strength. My aerobic fitness is excellent – I can go on for hours on end when it’s relatively flat, but as soon as I need to push a little harder for short bursts of time, there’s just not the right kind of power to do that. Since I’ve come back from Luxembourg I’ve been focusing on tempo trainings in order to increase especially my half marathon speed. That will solve part of the issue with lack of power, but as soon as I’m done with Challenge Aarhus, I will need to put more power in my legs for sprint distance triathlon in Aalsmeer towards the end of the racing season. Finally, I had a couple of really long swim sessions in Luxembourg. One was a 3km and the other was a 3,8km. 3,8km is the full iron-distance swim, and I wanted to get that one in just to tell myself that my swimming fitness is more than ready for the half iron-distance at Challenge Aarhus in July. That worked. I now feel extremely confident ahead of the race. I guess for any (self-coached, time pressured, non-professional) athlete it’s always tricky to find the right balance between training base, tempo, and power. In Luxembourg it showed that I have not paid a lot of attention to pure power. On the other hand, my A-race for 2011 is a half iron distance race, and maybe I don’t need that power for that type of event. It will be needed for the sprint later this year, though. Therefore as the year progresses, I will spend more time training tempo and power. Where is “Jakob’s Tri Training”? Jakob’s Tri Training is a self-hosted blog related to Triathlon, Running, Cycling, Swimming training and general Mind and Body fitness. Go to http://thusgaard.com and dive into the training logs. Enjoy! Posted byJakob May 4, 2011 Posted inUncategorizedLeave a comment on Where is “Jakob’s Tri Training”? Road to Challenge Aarhus: Can You Do It? In this post I’ll cover learning and observations from a self-supported half ironman. I’ll relate it to the time I train and share what I plan to improve at the Challenge Aarhus half ironman triathlon in July 2011. I think one of the most intimidating aspects of endurance sports on longer courses is the question that pops up every now and again with most people: Can I Do It? That goes for any run distance beyond 10km all the way up to marathon and, even more so, ironman distance triathlons and ultraruns. While I like a good challenge, I just don’t want to be toeing the line on raceday not knowing if I can do the distance. Therefore, if I have the chance, I put in a race distance training of my own to confirm to myself that I can in fact do the distance. In addition that’s an excellent way of checking your weak spots or things that don’t work, like nutrition, pacing, etc. On 16/4 I pulled myself through a half ironman triathlon (70.3 to some) on my own – with a bit of help on the run. It was a great experience and important for me to highlight what will and what will not work at the Challenge Aarhus half ironman in July this year. This is the full race report including things I learned. Got the day started at about 6:00 a.m. with a huge bowl of oat meal. Wanted to make sure to get enough carbs in long before the start. This worked well for me! The swim got started at about 09:30 and was fairly uneventful as it should be. I did a pool swim, so that will be different in Aarhus. I think the waves will be limited there, though, and it’s a wetsuit swim too, so if anything it should be easier. I just very much dislike swimming far in salt water. The salty taste just gets in everywhere. Here’s my time for the swim. Having finished the swim, I did a brief shower and changed into my trisuit, went to “T1” (aka my car), got the bike out, put on some cycling specific clothes to keep warm, and then left. That transition took about 23 minutes. For the bike I had myself a plan of staying calm, keeping the heart rate below 140. That worked well – I managed to resist the urge to start hunting down other cyclists. In addition the nutrition plan was to take in 500ml drink every hour and an energy bar every 35-40 minutes. That worked well too, and I had no energy dips while on the bike. Interesting, as always, to see the heart rate increase temporarily around meals. Did start to feel a bit tired when I got within 20km of T2, so I had an extra energy bar and reduced speed to give the body a break before the run. Here’s the time for the bike. Back at T2 I took the front wheel off the bike, put it in the car, changed from cycling top to running top, running shoes on and grabbed the drinks, gels, and some salt tablets for anti-cramp purposes. It wasn’t a hot day, but I wasn’t sure if I’d cramp up, so before the run I had a single salt tablet just in case. Now info tue run. Immediately felt a bit of pain in my left leg which quickly subsided. The pace was relatively high for being about 4 hours of activity into the event, and things were looking pretty bright. Had a gel around the 5km mark and continued to follow my nutrition plan and drink energy drink from the fuel belt bottles. Shortly before the half way mark I noticed that I had started to look more frequently at my Garmin 310xt – I took that as a sign of getting more tired. At this point I should have probably gobbled up another gel, but I didn’t. The next 8-9 kilometers I kept pushing out sub-5:30 kilometers, but with energy stores being depleted it was only a matter of time before I would crack. On kilometer 20 I couldn’t keep it up any more and dropped the pace by 30 seconds per kilometer, while watching my Garmin all the time. Needless to say these 2.1 final kilometers were the toughest of the entire day. Here’s the time for the run. I made it!! All sorts of triathletes had told me I should NOT do a half ironman as part of my training due to risk of injuries and too long recovery. But all that is important experiences for me to have, so I needed this training. Now that I have it, I know a few pitfalls and how to avoid them. I know the distance and that I will make it. 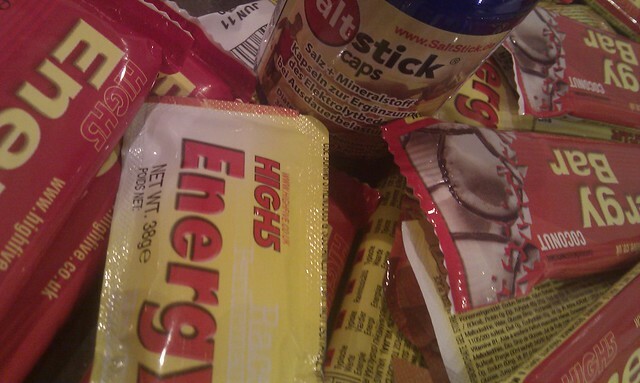 I know the energy food and how I react to it. In so many words, I know how to be better on raceday than I would have been if I hadn’t tested myself. If you’re wondering how I train to get the result above and to put things in perspective relative to training volume: I train just about 5 hours per week. Right now I have a swim session, two run sessions and maybe a bike session per week, but that could change. The reason I mention this is that most triathletes will tell you that 5 hours per week is not enough to do a half ironman. Well, I say it is – if you train smart and injury free. We’ll see how things go in Aarhus. Posted byJakob April 21, 2011 Posted inCycling, Half Ironman, Half Marathon, Running, Sports, TriathlonTags: 70.3, bike, Cycling, half ironman, running, swim, swimming, Triathlon2 Comments on Road to Challenge Aarhus: Can You Do It? Road to Challenge Aarhus: Nailing 70.3 Nutrition? Yesterday evening I spent some time trying to get my nutrition for the upcoming self-supported 70.3 half ironman triathlon on 16/4 right. It’s a pretty tricky calculation when you’ve never done it before. As ever so often with these kinds of things, I set up a Google Doc spreadsheet to help out with the numbers. As previously explained I’ve never really had a go at this distance, so making a nutrition plan that works is unlikely. Another good reason to try things out beforehand. I’ve now settled with about 560 grams carbs for an estimated 7 hours of activity. We’ll see if that does it. Either way I should bring some extra energy onto the bike. In order to have everything nailed there’s one thing that I haven’t calculated: my hourly sweat rate. Without that, I really do not know how much I need to drink or how much salt I need to take in. I’m just going to have to wing that one, but I’ll bring 3 tablets for the run to avoid cramping as I had some cramping issues last year going from bike to run in the Aalsmeer Sprint Triathlon. For final prep I need to pack the whole thing, check the bike, pack the clothes and God knows what else to finally be ready for the start on Saturday morning. Posted byJakob April 15, 2011 Posted inCycling, Half Ironman, Half Marathon, Running, Sports, Swimming, TriathlonTags: 70.3, biking, Cycling, half ironman, running, swimming, Triathlon4 Comments on Road to Challenge Aarhus: Nailing 70.3 Nutrition? This week is going to be mostly about getting ready for the self-supported half ironman distance triathlon I’ll be doing on Saturday 16/4 as prep to do Challenge Aarhus. You can join the event on Endomondo. Yes, it really is a triathlon even if Endomondo lists it as “other”. Also join the event on Facebook: http://www.facebook.com/event.php?eid=124035681003753. If you’re in Amsterdam, Netherlands on Saturday 16/4 you’re free to participate in any part of the total distance and any amount of disciplines. If you join the swim you should expect to cover the (tiny) expense on your own. Swimmers: total distance is 1,9km. Bikers: total distance is 90km. 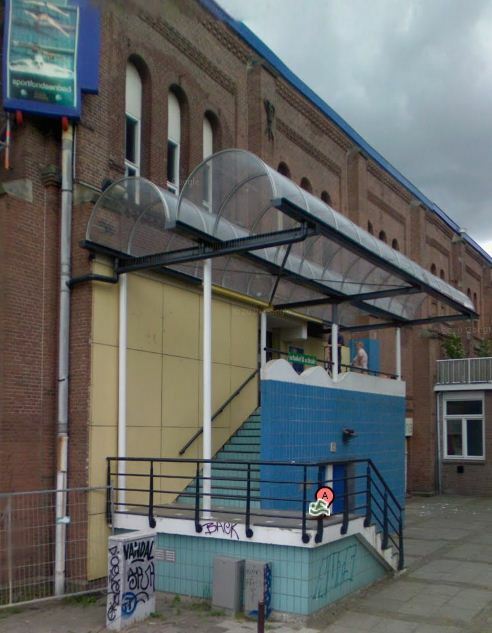 Start time is around 10.00 at Sportfondsenbad Oost: same as above. Runners: total distance is 21,1km. Start time is around 13:30-14:00 at Sportfondsenbad Oost: same as above. 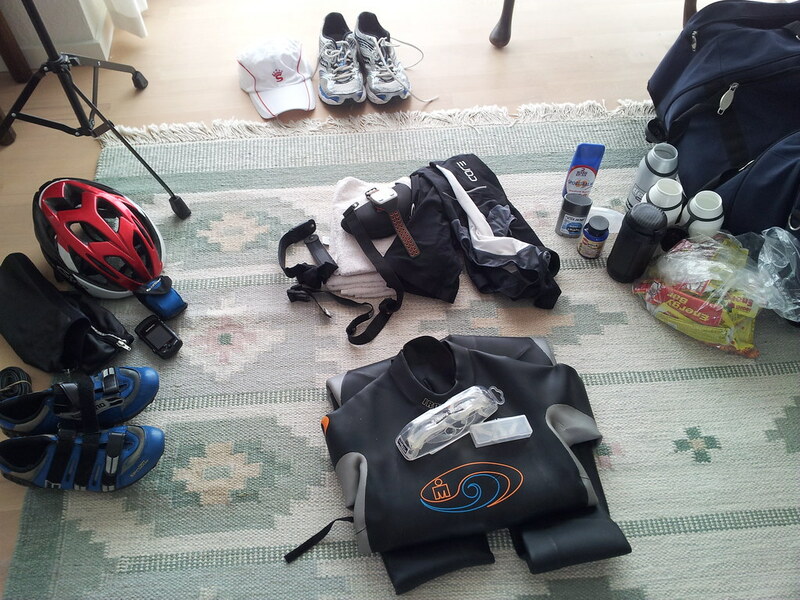 Go through the checklist at http://triathlon.racechecklist.com to make sure I have it all.